EUROPA: ONU/ECOSOC - Quando é que se toma o pulso económico à Europa? Segundo um relatório do Conselho Económico e Social da ONU (ECOSOC), é aconselhado que Portugal abandone progressivamente a austeridade e suba o valor do salário mínimo. Recentemente, o professor Adriano Moreira havia observado que o Conselho Económico e Social das Nações Unidas continua "completamente adormecido" e, perante a crise nacional, europeia e mundial, estranhou o facto de ainda ninguém o ter convocado. O Conselho Económico e Social da ONU é um dos órgãos mais importantes das Nações Unidas, composto por 54 membros, eleitos pela Assembleia Geral para mandatos de três anos. Destina-se ao estudo de questões relativas à saúde, organização económica, direitos da mulher, infância, direito do trabalho internacional, direito cultural e de independência dos povos. A preview of the World Economic Situation and Prospects 2015 (WESP) by the UN Department of Economic and Social Affairs (DESA) will be presented to journalists on Wednesday, 10 December. 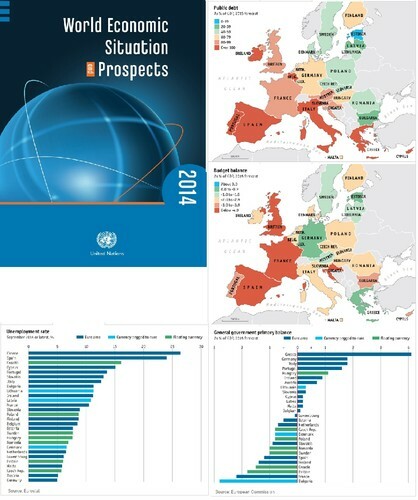 The WESP includes new analysis and forecasts for a range of global economic indicators, including economic growth, inflation, employment, commodity prices, interest rates, trade, deficits, exchange rates, as well as updates to the economic outlooks for all regions of the world. The World Economic Situation and Prospects 2014 reports that the global economy is improving but remains vulnerable to new and old headwinds. Global economic growth is forecast to accelerate from a sluggish 2.1 per cent in 2013 to 3.0 per cent in 2014 and 3.3 per cent in 2015. The report warns of the risks associated with the upcoming unwinding of quantitative easing programs in major developed economies. WESP 2013 presents a post-crisis world economy still struggling with continued weakening growth of 2.2 per cent in 2012. It projects disappointing global growth of 2.4 per cent in 2013 and 3.2 per cent in 2014 in the face of major uncertainties and downside risks. A much slower pace of poverty reduction is predicted in many developing countries and narrowing fiscal space for investments in the many critical areas needed for achieving the Millennium Development Goals. WESP 2013 calls for more forceful and concerted policy action at the global level, identifying fiscal and employment policies, financial market stability, development assistance and green growth as key challenges. WESP 2012 cautions that the world economy is on the brink of another major downturn. Global economic growth started to decelerate on a broad front in mid-2011 and is estimated to have averaged 2.8 per cent over the last year. This economic slowdown is expected to continue into 2012 and 2013. The United Nations baseline forecast for the growth of world gross product (WGP) is 2.6 per cent for 2012 and 3.2 per cent for 2013, which is below the pre-crisis pace of global growth. After a year of fragile and uneven recovery, global economic growth started to decelerate on a broad front in mid-2010 and this slower growth is expected to continue into 2011 and 2012. The United Nations baseline forecast for the growth of world gross product (WGP) is 3.1 per cent for 2011 and 3.5 per cent for 2012, which is below the 3.6 per cent estimated for 2010 and the pre-crisis pace of global growth. Weaknesses in major developed economies continue to drag the global recovery and pose risks for world economic stability in the coming years. WESP 2010 cautions that although the world economy is on the mend, the recovery is uneven and conditions for sustained growth remain fragile. The risk of a double-dip recession remains. The report also highlights a number of risks and uncertainties to the outlook, including a premature exit from the stimulus measures and a hard landing of the dollar due to the renewed widening of the global imbalances. In terms of policy measures, the report recommends continued fiscal stimulus measures in the short run, a continued focus on the rebalancing of economic growth in a number of respects, better policy coordination, strengthened global governance and more decisive reforms of the global financial system. WESP 2009 discusses the root causes of the financial and economic crisis that is rapidly deepening and spreading around the world and labels this as "a story foretold" since previous issues of WESP warned for the mounting risks of a global crisis well ahead of its occurrence. The report discusses how developing countries are being affected through trade and financial channels. By end 2008, the crisis intensified. To put an end to the ensuing firesale in asset markets, free fall in global trade and fallout in global aggregate demand, the report calls for massive, globally-coordinated monetary and fiscal stimuli and details the far-reaching reforms of the international financial system needed to safeguard against similar global crises in the future. WESP 2008 highlights the risk of a recession in the United States and a hard landing of the global economy as a whole. The combination of a deep housing slump in the United States, continuous devaluation of the United States dollar and related increased financial turmoil could trigger an abrupt adjustment of the global imbalances, which would not only send the economy of the United States into a recession, but would also lead to a hard landing for the global economy as a whole. Lessons need to be learned from the recent financial turmoil to reduce vulnerabilities to future financial stress. Responses by the central banks of the major economies have focused on liquidity injections to restore financial market confidence and avoid a credit crunch. These measures have had some temporary effect, but have also raised questions regarding the quality of financial regulation and financial safety nets, both nationally and internationally. More fundamental regulatory reforms are needed, next to reform of the global reserve system. WESP 2007 singles out the possibility of a more severe downturn in the United States' housing markets as the key risk for the global economy. A number of economies have witnessed substantial appreciation of house prices over the past decade, and the associated wealth effects have contributed to relatively strong economic growth rates. A reversal of the process may thus lead to significant negative fallout for world economic growth. The risks associated with the housing sector are serious also because of the inextricable linkage between the increase in house prices and global imbalances. The housing booms in countries running large external deficits are being indirectly financed by borrowing from the high-savings countries running external surpluses. Therefore, a collapse in house prices in major economies would provoke a contractionary and abrupt adjustment of global imbalances. Intensive macroeconomic policy coordination between major economies will be needed to prevent a disorderly global adjustment. The report spells out the conditioning factors for effective policy coordination and the key areas to be agreed upon. The world economy is expected to continue to grow at a rate of 3 per cent during 2006. The United States economy remains the main engine of global economic growth, but the growth of China, India and a few other large developing economies is becoming increasingly important. On average, developing economies are expected to expand at a rate of 5.6 per cent and the economies in transition at 5.9 per cent, despite the fact that these economies may face larger challenges during 2006. Driven by higher oil prices, inflation rates have edged up worldwide. Core inflation rates, which exclude the prices of energy and food, have been more stable, indicating that the pass-through of higher oil prices to overall inflation is limited. The continued recovery of the world economy resulted in unusually widespread growth in 2004, but a modest slowdown in all regions is expected in 2005, according to projections contained in World Economic Situation and Prospects 2005 (WESP 2005). Developing countries grew at the fastest rate in two decades in 2004. In addition to the stimulus provided by the United States, China is making an increasing contribution to global economic growth. Its rapid expansion has contributed to increased global demand for oil and many non-oil commodities, with the higher prices for the latter being of particular benefit to several countries in Africa and Latin America. Overall, prospects continue to be good, but the global imbalances pose a potential threat, to which a global response is required. Many of the forces responsible for dramatic growth in the previous decade are now absent or not strong enough to produce such robust performance. While global trade is projected by the World Economic Situation and Prospects 2004 (WESP 2004) to grow by seven per cent this year, it is unlikely that the buoyancy of pre-2000 years will be repeated, especially given setbacks in the Doha round of trade negotiations. The recovery of foreign direct investment will be similarly subdued, as will rebounding investment in information technologies. And in 2004, the dampening effects of geopolitical tensions and threats of international terrorism are more prevalent than in the years immediately before 2001.Therefore, the report urge careful measures to nurture the recovery and avoid a precipitous unwinding of international imbalances. Following some signs of stabilization at the end of 2002, global economic growth is expected to improve in 2003, but the strength, breadth and sustainability of the recovery remain subject to many uncertainties. Risks associated with heightened geopolitical tensions, such as the possibility of higher oil prices and lower business and consumer confidence, are the key threats to global economic recovery in the short run. In such a global economic environment, policymakers are facing prodigious challenges. Macroeconomic policy worldwide has been generally accommodative over the past year and has helped prevent the world economy from falling farther into a synchronized global downturn. The present global economic weakness could be aggravated by prevailing uncertainties, to the particular detriment of many of the world's poorest. Bringing about a robust and sustained recovery in world economic growth should therefore be the top priority for macroeconomic policies in most economies in 2003. Over the longer run, further structural reforms are needed so that both national economies and the international trade and financial systems contribute to higher and more balanced growth. A pervasive slowdown in the world economy, aggravated by the terrorist attacks in the United States of America, has led to the lowest growth of gross world product (GWP) in a decade. GWP grew little more than 1 per cent in 2001 and the volume of world trade stagnated. More than a dozen economies, accounting for more than two thirds of world output and including the world's three largest economies, were falling into recession. For the year as a whole, growth in the developed countries was the lowest in a decade. The economies in transition exhibited greater resilience but their average growth also declined. The key concern of economic policymakers at the beginning of 2002 is to ensure a prompt and widespread economic recovery. The report forecasts a gradual recovery beginning in 2002, with GWP expected to grow by only 1.5 per cent and world trade by 3 per cent. Economic growth in 2000 was unexpectedly and unusually high and widespread. The increase in gross world product (GWP) exceeded the earlier forecast of 3.5 per cent and was the strongest in more than a decade. This outcome was the result of improvements in all major regions of the world and was associated with double-digit growth in the volume of international trade. The world economic recovery that started in 1999 reached its peak before the close of 2000 but is expected to continue until at least the end of 2001, albeit at a slightly slower pace. The outlook is for global economic growth to moderate from 4 per cent in 2000 to 3.5 per cent in 2001, with the slowdown limited in extent and geographic scope. At the beginning of 2000, the world economy was in better shape than the previous year, when the aftermath of the financial crises in Asia and the Russian Federation and the uncertainties relating to Brazil clouded the outlook. It is estimated that gross world product (GWP) expanded by 2.6 per cent in 1999, a notable improvement over the 1.8 per cent for 1998 and 0.6 per cent higher than had been anticipated in mid-1999. The signs of strengthening and broadening of the recovery in the world economy identified in early 1999 have gained momentum. The outlook in major countries is for a slight acceleration to almost 3 per cent growth of GWP in 2000 and a return to the pre-crisis pace of over 3 per cent in 2001. The world economy is now growing at its slowest rate since early in the decade. The recession in Japan, the East Asian crisis and the Russian crisis—along with contagion throughout the financial markets—combined in 1998 to halve the growth rate of the world economy and to raise concerns about a global recession. At some points during the year there was fear of serious damage to major financial markets. Compared with the previous year, 23 fewer countries saw an increase in output per capita in 1998 and no significant improvement is expected in 1999. Moreover, world trade in 1998 grew at less than half the pace of 1997, and about the same growth rate is foreseen for 1999. International prices (in US dollars) of crude petroleum fell by about one third and non-fuel commodity prices by about one eighth in 1998. With no acceleration expected in the growth of world output, and thus of demand, commodity prices are forecast to remain depressed in 1999.